Is Scrapbooking Dead? And is Archiver's Closing REALLY the End of the World? CHA is this week. Yeah. That “Craft and Hobby Association, world's-biggest-craft-trade-show, paradise for crafters, the golden ticket” thing in Anaheim, CA every year. Exciting? I have mixed emotions on it. And the announcement of Archiver's stores closing last week seemed interesting timing. There's discussion about what this means for the craft industry. These last few months I have felt a feeling I have felt before but much more intense. A feeling of overwhelm. Overwhelmed by my stuff, my crafts, my unfinished projects, my craft-hoarding…I have pretty much slowed my buying to virtually a HALT since my friend Bronwyn Velasquez and I did a “Patterned Paper Diet” a few years back – we decided to not buy any patterned paper for a year. I mean, I had a 9 foot+ tall stack of paper. Did I really need another sheet of comptuer-generated stripes or whatever $1 per sheet paper? Um, no. And I still don't. I stayed on the “diet” for 18 months. It was amazing how I didn't really miss buying paper AT ALL but the first few times, it was like trying ot quit smoking or something. I instinctively grabbed for paper and then pulled my hand back fast, like the paper was poisonous! 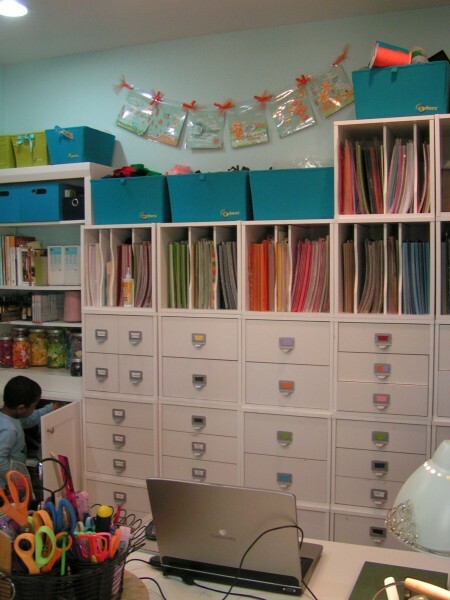 Why do we have this relationship with stuff, specifically our craft and scrapbooking supplies? I think a journey back to the beginning is necessary. Back to the beginning of my journey inscrapbooking, which I imagine is pretty similar to your journey. 1998 – I got a mail order scrapbooking kit to catalog my daughter's life. I went to Michael's to get supplemental 8.5 x11 patterned papers here and there, maybe a magazine, a lettering template. It all fit in one box. 2004 – I bought my first diecutting system – Quickutz. I dropped over $400 in one store in one day. That became common-place. 2005 – I started teaching classes at local scrapbook stores regularly, went to Survivor Crop, and used the money from my then full-time job to buy buy buy. 2006 – I was pregnant in line at a scrapbook store closing sale with two shopping carts filled to the top with papers and nonsense – again, most of which has recently found a new home at Charity Wings Art Center. 2007 – I started making bigger money teaching classes, opened an etsy shop, and just started filling tubs and tubs and tubs with supplies. I graduate from a corner of the dining room to a full on ROOM filled floor to ceiling with supplies. 2008 – this is when the market started to decline. Stores started closing by the 100s each year. I started feeling overwhelmed. You see, in those early years we didn't have access to much besides Mrs. Grossman's stickers and a few sheets of ladybug paper by ProvoCraft. So when we started getting exciting new papers, like BasicGrey (2005) and cool tools like Quickutz, we went nuts! Good supplies were so scarce that we had the mindset that if we didn't buy it then, we would never be able to find it again. Couple that with a booming economy and we had lots of money to spend. People were pulling equity out of their homes to open stores – the stores were plentiful and the manufacturers couldn't pump out product fast enough to fill demand. And then stores started closing. We started stock-piling stuff from these closing sales because the deals were so good and we were still in this mindset that GOOD supplies were scarce. We posted on forums and then on Facebook that we “spent more time organizing than scrapping”. Organizing your (s)crap became a huge topic and industry of its own. Do you go with the Cropper Hoppers or Crop In Style? Clip It Up or Scrap Rack? 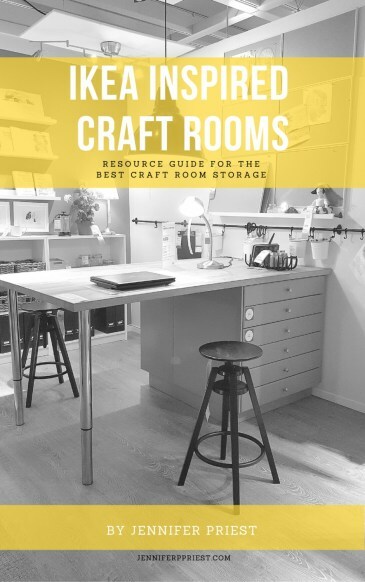 From closet to full on scrapbook room? THEN it was the era of challenges: Stash challenges, use your stash, get rid of stuff, purge, RAKs, swaps, use-it-or-lose-it, scrappy garage sales, selling your stash on Facebook, and more to just move this stuff OUT! They've taken up OTHER crafts – knitting, sewing, embroidery, calligraphy, etc. Scrapbooking was a gateway to other creative endeavors. They may or may not have stopped scrapbooking. But with limited time and resources, they aren't scrapbooking as often as they used to, hence they don't need to buy as many supplies. Scrapbookers are simplifying. That can mean doing a simpler, faster method of memory preservation like Project Life, using the supplies you already have and not over-embellishing, and/or going digital. I have personally questioned how many pages I need to do for an event. There are some Easters I have 6 scrapbook pages for. This year, I did ONE. How many 10lb albums am I going to send my kids off to college with? 40? We're also just scrapping the milestones and bigger moments versus every waking moment. People are being more frugal and deliberate with their money. We have had to change how we spend and how we look at money and shopping because we were directly affected by the economy or are reacting to what we see happening to others. Either long term or at least temporarily, most everyone I know has had to give up craft spending because they weren't even sure how they would get their next meal. How can they be concerned about buying pretty paper when they have creditors calling and are busy looking for jobs or trying to make ends meet for a family? Crafts are a luxury. And on top of that, when you are going through rough times, there aren't many happy memories people want to be cataloging via scrapbooks. I won't be scrapbooking the crap I had happen to me this last year and I have fewer pictures to show for it because we weren't doing happy, significant things as much as we have done in years previous. We really don't NEED anything. I have 6 feet of paper. That is roughly 7200 sheets of paper (12 inches = 100 sheets. 100 sheets x 72 inches = 7200 sheets). I will never use all of that. And that is after my most recent PURGE. I have tons of embellishments. I mean, how many paper flowers do you really need??! Um, I don't need ANY. I can probably go 2-3 years with only spending maybe $30-50 in a craft store a year for something I don't have, like spray paint. And that would be for a NON-scrapbooking project. I throw my Joann's mailers in the trash – I don't even want to get 40% off on anything. It is just another thing I have to put away and manage and organize and, dammit, I am tired of organizing! We all stocked up during the big boom and then during all those closing sales. It is going to take YEARS to work through these stashes. And with husbands and family members and friends and even OURSELVES looking at this, we can't help but hear, “do you really need to buy ANOTHER piece of paper? Don't you have enough already?”. The needs and wants of the consumers HAVE changed. The question is, will retailers, manufacturers, and designers listen? I don't think the industry as a whole has changed enough to keep pace with the consumers and to give them what they want. Archiver's closing is evidence of that. But, we can have these discussions and start to think analytically about what we want as consumers, what we as retailers can offer to consumers, and what we as retailers need from manufacturers. That is how change will happen. From the bottom up. How it is useful? Its only use might be to bring joy to someone but that makes it useful. How is it frugal? This is especially true of my kit club kits. I don't want to send you a bag of crap you won't use. I try to give you great product and on top of that great ideas for using that product. Candice does the same thing (our Designer) – she finds unique ways to use the products that we then share with you. How is it valuable? It is not so much about “getting alot of stuff for very little money”. I think that is part of value. But the other part of value is how it improves or impacts someone's life. No, a scrapbook paper will not make your bills go away or clean your garage for you. But it can help you solve a problem, help you create something for someone else, or help you preserve a memory. There are other considerations too. But as an industry, we have to get back to the consumers. What does a busy mom who scrapbooks her kids' soccer games really want from US? How does what we're doing add value to her life, to her experiences, to her family? From what I've read about the experience at Archiver's, it did not give enough value to the people who were shopping there. The industry will continue to change – but how do we change with it? Tell me what you think – about our industry, about your own crafting an scrapbooking, and about what the future holds. How do you feel about Archiver's closing? Does it impact the industry at all? I followed you as a store owner- after I closed my store I was lucky enough to win a a Artfull Horizons crop … the event of my life…. I came home thinking WOW those girls in California have it going on! I tried to keep doing local crops, sell to my friends, do a kit club all un-successful and frustrating… I finally said no more– I do find myself buying a bargain every now and then… bad habits are hard to break (but I don’t smoke so its ok! No it’s not dead its changing, maybe the new (next group) are thrifty, non-hoarders? the DInks are gone (double income no kids), Yuppies we are the grandparents now? It has changed again , but the paper companies are part of the blame = anyone with a business permit can sell and they are happy! No storefront, no current website, heck just sell to your friends out of the garage and on facebook! Why bother when you can NOT compete ( that is what most closed LSS owners will tell you, you can not stay in business selling paper for $1) and everyone can use a 40% coupon and get the tools at the big box. As for Archivers – same as everyone else too many locations , big overhead,changes in the way people are scrapping pocket pages vs layouts? I hear and read in all these facebook groups about the demand for a certain I have it stamp , project life card kits are being spilt and sold to each, wood veneers are being spilt and sold to each other because who really wants a whole pack of potty people? I have 22 12×12 boxes 200+ sheets in each and 12 verticals of paper, a small operating room of the lastest and greatest gadgets I had to have … collecting dust … that I will not sell because of my investment, instead I have 3 granddaughters that I fill boxes for and give it away! You know I am looking forward to the next release of the latest and greatest and I will buy some! I love to go to my local scrapbook store (70 miles away) and walk and touch and buy some just because its pretty! Kathy….you’re killing me! “potty people”!!! Bwaahhahaaa I am dying! I agree with you — it is far too easy to get a seller’s permit and wholesale account and I do see people on Facebook selling stuff and undercutting stores. But I think that is a sympton of the times and will go away soon too. They will get to the point they have enough or too much stuff and/or get to the poihnt that it is too much work to not make any money at it. It is fun to admire the papers, I had a talked a fellow artist yesterday about this guilt/crisis of integrity I feel about sharing about new product when I am not going to be buying much of it. It’s okay to look and share somethign I think is wonderful! We pin images of shoes and purses and clothes and homes we’ll never own. I am not telling you to buy it, I am telling you I like it and you might like it too. It really helped my perspective. I will be posting pics and possibly pick up that Jenny Holiday paper! WOW —– I kinda wish you would have posted this yesterday. It really made me stop & think about my vast supply of scrapbooking & craft supplies. I just ordered a huge amount of paper /kits / stamps from someone on the internet because she was destashing & “it was such a great deal I couldn’t pass it up” !!!! We are just finishing a remodel of our 1 1/2 car gargae into my craft room. At least that wasn’t expensive since we already had most of the things for the remodel. BUT — you made me really re-think things! As far as Archivers —– don’t have one near by —- only been in their store once. If you use the items and you love them, then it is okay to buy! What I am saying is we bought for the wrong reasons in the past and got more stuff than we could ever use. The point is to use it and enjoy it. If it provides that for you, then it has value. I was really saddened by the news of Archivers closing. But then I really thought about it. I didn’t really shop there all that much because they never really had sales on the things I wanted. I mean, don’t get me wrong, I’d occasionally go use the coupon but for my staples like cardstock I go to Michaels because I get the employee discount and they have great sales. So I would stock up. Cool embellishments? I’ve got enough to embellish the world…. I buy Cricut cartridges online mostly…. so really I only used Archivers to see the new papers in person and decide if I liked them enough to buy yet MORE paper…. now I guess I’ll have to hope it looks as good on my computer screen as it does in person… Ugh. I love that we’re now all stepping back and thinking about our purchases and what we really need and want. Thanks so much for this insightful comment! I agree with much of what you said. I see it too with the scrapbooking magazines that keep going down in flames. I just thinks it’s sad. There is so much that we can take away from crafting I’d hate for everyone to realize it after it’s too late. I’m probably more used to it because I live in Miami. There is nothing here for crafters. There is just too much to do in this city and the fast paced lifestyle that nothing crafty survives. I’m just glad I found a hobby that helps keep my sanity. It’s my therapy. That’s enough. And who doesn’t like looking at all the pretty stuff right?! Very good read… I for one have seen it as you say… I started with a few items and then boom, the explosion of craft crazy… that is what i call it… where we were flooded with things, and people are building custom rooms, buying outrageous amount of supplies then we were hit with reality… I have thankful only lost my mind a few times and bought things I really did not use… and thankfully due to my OCD i get rid of them, donate them, or gift them… At this point, I really believe that companies do not hear us customers. They are telling us what we need, what we should want, what makes us real crafters (don’t get me started on that topic…lol), instead of listening to what we as crafters/artists/creators could really use… Sadly I see the local stores close down and I feel bad. But the truth for me is, I don’t go to those stores, I don’t buy anymore in bulk, and I have stuck to my rule… If i don’t use it in a year get rid of it. Sell it, donate it or gift it… and I am not allowed to buy anything unless and a huge UNLESS I run out of it. OMG I love that!! “Craft Crazy”! I agree with you on so many points Yvonne…I feel more blog posts a-brewing! I must admit that I am rather guilty of taking some of your stash off your hands from your former Etsy store 🙂 but I could not agree more with your article-I am guilty as charged! I started out asking for a crop and store XXL tote from my hubby who never thought in a million years that I would ever have enough stuff to fill it…that thought lasted about a week (think if you build it they will come!) and it has been downhill ever since. How many pads of Christmas paper does one really need to buy at 80% off when you already have 2 dozen unused ones from the prior sales? When does enough become enough? I am almost at the point where I spend more time organizing than enjoying my hobby and it is a real downer to have to fold up the chair to get away from the table because there is so much surrounding it that you can’t get out. On a separate note, I don’t live in an area where I was effected by Archivers, although I did often browse the website for ideas and inspiration and I will miss that portion of it. I have one LSS store that I don’t frequent, although they seem to stock what the people want and if they don’t have it, they will get it. CHA seems to set me into a frenzy only to disappoint when my local big box store doesn’t have the latest and greatest until 3 years later….I just try not to look and work with what I have and trade off/share/swap with my scrapping buddies when I can. Haha don’t feel guilty – if it brings you joy or some kind of other value, then awesome! It’s okay to get some new things. Like if you have alot of paper pads, stop buying paper but maybe treat yourself toa new embellishment after you’ve scrapped 20 pages or some other accomplishment. This way you work through your stash but you aren’t depriving yourself completely of new fun things either. We have to stay inspired. Great article. Totally makes sense. I to have cut back on purchases, purged, & got more organized. I mean it hurts me to say that. But it doesn’t mean we can’t still enjoy new product and we can’t buy. It just means we are more deliberate in our buying. I agree with most of what you said, and I think most seasoned scrapbookers came about the industry about the same way. The hoarding is bad. I love the idea of a patterened paper diet. I need to go on one too. Embelishments, I have tons, and rarely use them. I have stopped buying them though. I think as a seasoned crafter, it is so hard to walk away from a NEW product. I have been crafting since I was a pre-teen and have always been a gadget junkie. I don’t buy as much paper, I do try to support the LSS that get in products I am interested in. The industry could be in trouble if we dont get new people involved in the craft, because all the seasoned veterans have come to the realization that we don’t NEED anything. I still buy cardstock, and adhesives I am in the mindset of using what I have, and adjusting when necessary. As long as we all don’t go on a moratorium, the industry will survive. Look at sewing, I used to buy lots of fabric and now I don’t but there are many that still do. Now ceramics is a different story for a different day. YES Sheila!!! We totally need to get new people in and the younger generation. We have to make crafts cool. Frankly, few crafts I see make me think cool these days but there ARE people out there doing inspiring amazing things. These are the people that brands should be working with to get new people attracted to crafting. On the need to hoard…I think the problem with scrapping and us hoarding is because the paper houses have seasonal ranges and when they are finished, they are finished…thats it. Therefore the desperate urge to get it while you can kicks in cos you might not be able to buy it when you need it. The same with the stamps and dies that come with those ranges. As a teacher I find it frustrating because I would design a page to teach, not knowing how many peeps I was going to get and then would not be able to create exactly the same kit…VERY frustrating. So then, depending on which store I was teaching at and their capacities, I would buy 10 or 20 of everything I thought I would use on the page only to have 6 or 12 peeps in a class and be left with stuff. The way I teach I can’t make kits really cos a lot of the class is technique based and inked, stamped and embossed with my tools. So making kits up to sell of the class I had taught was hard. Almost like having to make the page for them and they just had to stick their photos on and not getting paid extra to do all that time consuming work! So yes, I have tons of stuff too. Mostly left overs. I am a big Tim Holtz fan. Mostly because his stuff rarely goes “out of date” style wise cos it is already vintage and because it is always available to purchase. I do not feel the need to rush and buy it, cos I can get it when I need it and if I can afford it. Some of his stuff I “need” as soon as it is launched cos my head spins with ideas, but by the time I see it on the shelf I am sometimes “over it” depending on if the ideas have died or not. On Archivers closing~I could care less one way or the other because I have never stepped foot in one of their stores nor purchased from them online. I am guilty of hoarding but only the products that really speak to me. I am disabled and home pretty much 24/7 so I have ample time to use all of the goodies that I buy and it keeps my mind off my pain and troubles, even if only for a few hours. It helps ease the loneliness too. I only buy my papers from a few companies because they are the ones I LOVE. For my other papers I use whatever I win to supplement what I have. I find that I am more creative because of that. Sometimes I am shocked at what papers I am able to combine and get a cohesive finished project. I try to save up for when the companies I love come out with their new releases and then treat myself. I have one company that I buy from monthly because I absolutely adore their collections. I hope that scrapbooking/paper crafting does not go totally digital because I like the feel of the papers in my hands. I know I can print them at home but not on the papers that the companies I love use. There is a big difference to me in the feel of them. Saying all that, I am in the process of going through my stamps and other “tools” and am getting ready to do a big sale of stuff that I don’t really need or use. Some of the stuff has never been used and is still in the original packaging! Some is stuff I won that came in prize packages and won’t use but I NEVER enter a contest if I do not like the prize or won’t use it. I think that would be selfish and greedy to enter just because it is a contest. I would much rather save my luck for something I DO like and WILL use. Well put! I was sad when I heard the stores were closing. I loved the crops and just browsing (buying of course as well). Then I realized that I would save a bit of money and start using my stash. I do SU and now will need to plan a bit in advance for my projects and I think I will try to host crops in my home for my friends. I met so many great people in Archivers and it was pretty cathartic to go and mourn. Wow thank you for sharing your story! And good luck with the SU venture! Great read! I have been feeling this same sinking feeling for a few years now and I completely agree with many of your comments. I started scrapbooking around 2002 and have ever since. Although I have always been relatively frugal, the biggest change for me in shopping less is that I can make most of the embellishments with my own machines. With an embossing machine, a silhouette, and several stamps, I can make my own items without needing to go to the store. I will say that when I go into a store, I seem to loose my mind but I just don’t have that reason to go anymore. I just purchased a Scan N Cut, have a Sizzix and Fiskars fuse, plenty of paper and white card stock, crayons, water colors. Only thing I buy is glue.